A lot of arcade games had the ability to see the current highscores from the main menu, giving you a target to aim for, and hopefully beat. I learned this from watching King of Kong. Whilst there arnt many pictures available to illustrate my point, the ability to go round an arcade and see your name on the top highscore list of various games clearly had an impact in the 80’s as this highscore culture lead to intense rivalries. If highscore lists weren’t easily accessible, then this phenomenon wouldn’t have been so common place. My game was lacking this feature. The only way to see the highscore list was to get a top 5 highscore yourself. I’ve put in a table on the main screen. 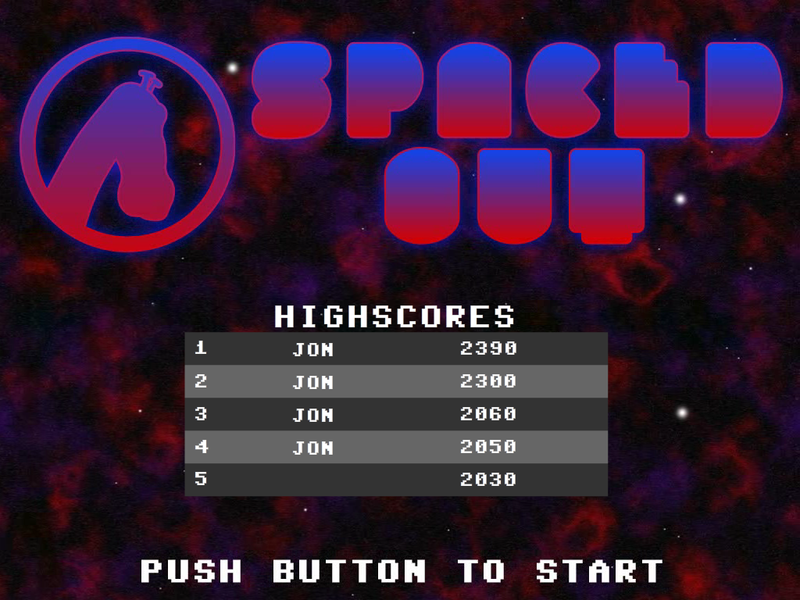 Luckily, and by that I mean with immense foresight and fantastic coding skills, I had made extremely easy to create a top 5 highscore table and populate one on screen at any point within my game. So I just had to copy the code and copy the table to the main screen section. And there we have it, a main menu screen that gives you a target to aim for.